Pedagogy is how you teach children and Andragogy is how you teach adults. So how do adults learn? And how is it different from the learning designed for children? I recently attended a session by Rick Blunt on eLearning Guild’s online forum (The eLearning Guild online session Interactivity vs.Interaction: Align their Simplicities and Complexities). Rick presented a very useful diagram which stated that there are 5 characteristics, which if acknowledged, can help eLearning professionals create more meaningful learning experiences for adult learners. 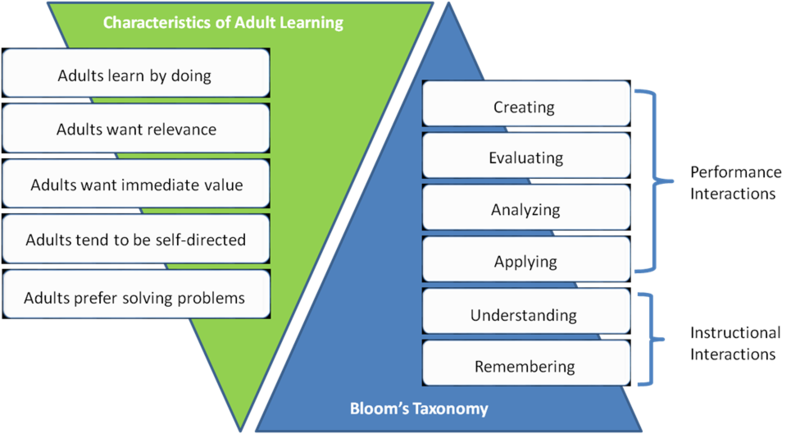 According to Rick, when adults start solving a problem, they tend to follow Bloom’s taxonomy. They first apply what they know, then analyze the problem and apply different techniques to resolve it. - Practice makes a man perfect. Adult learners perform better when they practice frequently. - Periodical learning is the best type to retain learning, accuracy and acumen of skills. - Environmental practices that help adult learners perform their role better need to be created. - Adult learners appreciate practical knowledge than theory. 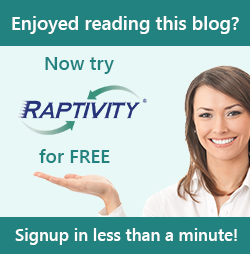 - Immediate relevancy and value can help adult learners enhance their skills. - Adults do not prefer linear courses; they prefer to explore the course in a way that is meaningful to them. I could map all these characteristics to a sample we recently created for a prospect. The sample was based around ‘The benefits of eLearning’. 1) The company was creating strategic plans for next year and the sample had an immediate value in that discussion. 2) The sample focused on the problems the company faced for training their shop floor employees and how eLearning could help them resolve these issues. 3) There was a relevant case study of a similar kind of company incorporated in the sample, which could help the company understand the concept easily. 4) The sample presented relevant facts and information which could help the management take decisions easily. 5) Considering adults tendency of being self directed, the sample allowed users to navigate to the topic of interest. Do let me know if you have created any sample for adult learning which follows the characteristics shared above.